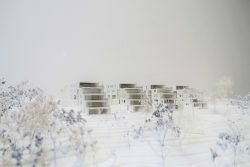 On this particular site, our proposal is to create a proper identity over a minimyzed architectural impact and over a qualitative urban landscape, ameliorating the links between the valley and the village. This project leads to answer to new worlds of actual life. 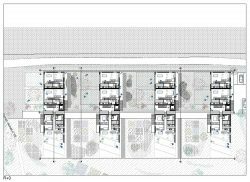 If this lot model gets out of breath today and would get out of breath the beauty of the surrounding landscape, the principle of a terraced low-rise dwelling suggest to melt within the landscape an gives assets of the individual house . 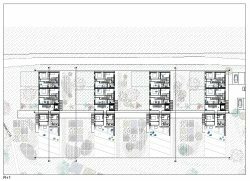 The project is the implementation of four individual buildings on the site, perpendicularly to the slope and to the ridge line. 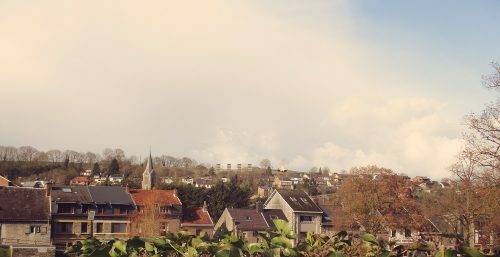 Those terraced volumes, of three levels top, are oriented with a view over the village's chore. Suggesting this implementation give the transparency through the site from the valley to the hill is provided. 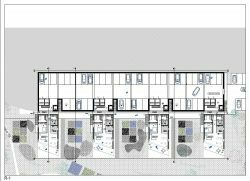 The land's profitability increased by this type of building is promoted and the rise afford more green spaces and appropriables surroundings for the inhabitants of the site, but also for Hamoir inhabitants. 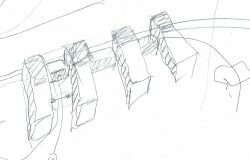 The aim is to value the collective quality, to suggest an extension of the village over a classical dwelling made of four-facade house shaped with hurdles.